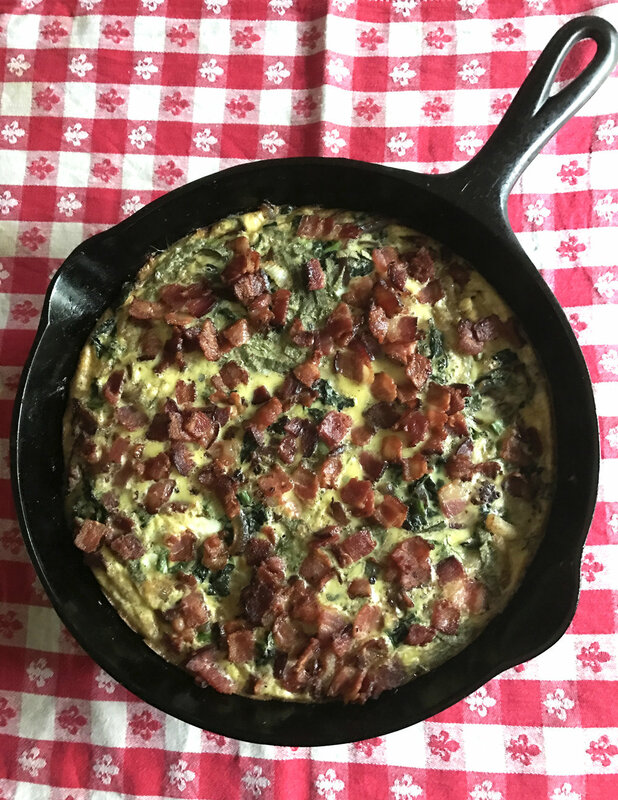 Fall Frittata — Good Food Makes Me Happy! This is the perfect frittata for a rainy (or snowy) Fall/Winter day, packed with flavor using fresh fennel and kale, crisp bacon and with a sweet potato crust. A sprinkling of nutmeg and fresh sage leaves in the eggs before adding to the skillet is brilliant. A cast iron skillet is a must for this recipe. Get all your ingredients prepped before starting to cook. Leftovers keep well for a few days in the fridge. Preheat oven to 400 degrees. Put the sliced sweet potatoes in a saucepan with a few tablespoons of water. Sprinkle with some salt and pepper, cover and turn the heat to medium low. Let the potatoes cook until they're almost fork tender which only takes a few minutes once the pan gets hot. Carefully remove the potato slices to a paper towel to get rid of any excess water. Put the chopped bacon in a cold, cast iron skillet, turn the heat to medium and cook the bacon until it's crispy, about 8-10 minutes, stirring occasionally. When done transfer to a paper towel. Keep about 1 T. of the bacon drippings in the pan and add the sliced fennel, onion and garlic to the skillet. Saute until softened and starting to brown, another 8-10 minutes. Add the kale and stir until wilted, 3 or 4 minutes. Season well with salt and pepper, then transfer to a plate. Add the butter to the pan. When melted, remove from the heat and arrange the sweet potato slices on the bottom of the skillet, overlapping and filling in holes as necessary. Put back on the heat and cook for a minute, undisturbed. Spread the fennel, kale and onion mixture over the sweet potatoes and turn the heat down to medium low. Beat the eggs in a bowl and add the sage leaves, a little freshly grated nutmeg, and salt and pepper to taste. Pour the eggs into the skillet, covering the mixture, but don't stir. Let the eggs start to set, which takes 3 or 4 minutes. Sprinkle the bacon over the top of the frittata and transfer the skillet to the oven and bake for 12 minutes until the eggs are set. Let the frittata cool for 5 or 10 minutes before cutting in wedges and serving. Yum!